Last weekend we had our practical in school. I did well. Granted, I practiced a great deal ahead of time and failed once or twice as well. Our practical included a written test; we also had to create a flourless chocolate soufflé as well as creme anglaise, which is the base for french ice cream. I gotta admit to something. Up until this exercise, I never, ever would have opted to eat an egg-based ice cream. But this is damn great stuff. For those unfamiliar (as I was), you can’t taste the eggs at all. I guess I ignorantly thought you’d be able to! It’s just ice cream, rich, creamy ice cream. It’s wonderful. Today, I’d like to share that recipe with you. 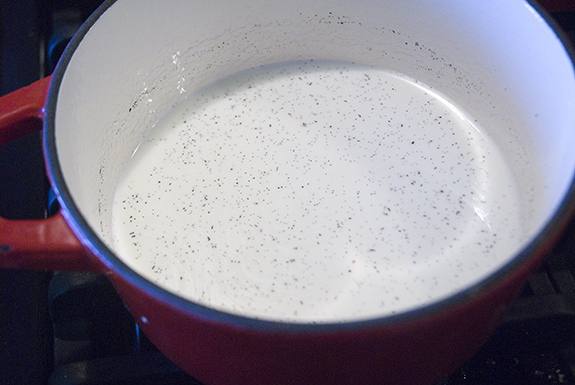 Combine half and half, sugar and scraped out vanilla bean in a saucepan. 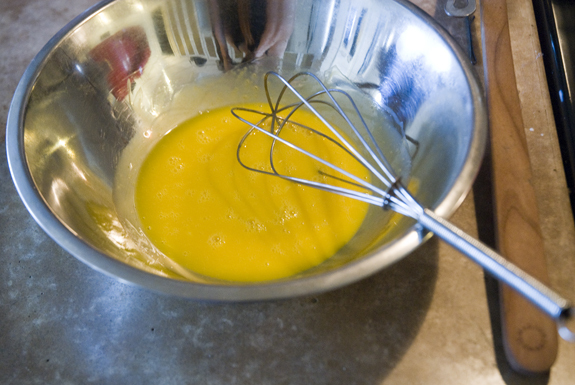 Combine 1/3 of the hot mixture into the yolks whisking the entire time. (You want to temper the eggs but not scramble them, hence the constant whisking.) Add that mixture back into saucepan. Continue to heat that mixture over medium heat for 30 to 60 seconds stirring the entire time. You do not want the mixture to boil. YOU DO NOT WANT TO OVERCOOK IT. You do not want the eggs to cook. (It’s easy to do!) The mixture will thicken a bit. Once that happens and it’s coating the sides of the pan or you’re able to run your finger over the back of a metal spoon without the liquid coming back together again, you are done! Strain it immediately into a bowl over ice. The strainer will collect some pieces of cooked egg. This is normal. Let that cool and then refrigerate overnight. You’re ready to make your ice cream! And damn is it awesome. The key is to not overcook the base. So keep an eye on it. It really should be thick and ready to go in a minute. If you remove it from the heat and it doesn’t seem thick enough, then just go ahead and put it back on. It’s better to undercook and then reheat it right away than to overcook it. Because once it’s overcooked, there’s no saving it. Flavor the ice cream however you want! Simply omit the vanilla and add whatever flavor you might want. 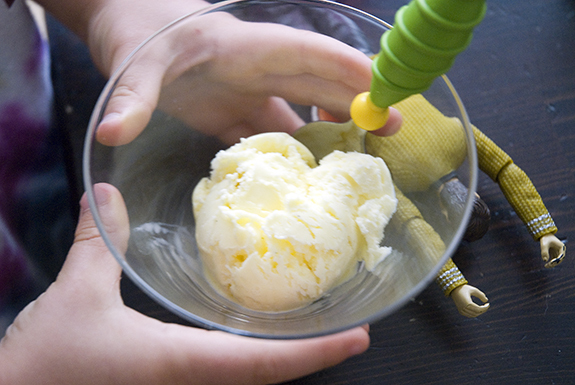 You can also add chips or nuts, but do that by hand after the ice cream is made and ready to serve. 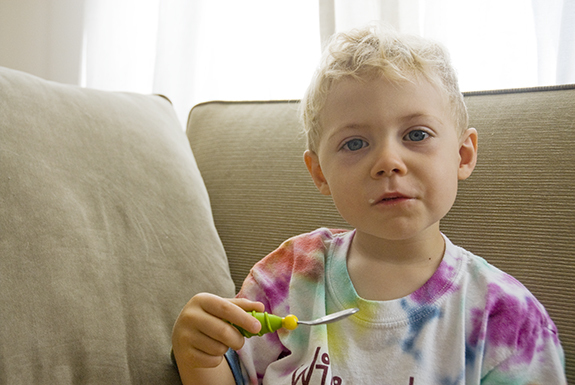 Next Post Tuesdays With Murray (Chapter 140) A Question About My Boy. Do you have the cutest kid ever or what?!? Holy Smokes Emory is growing up! He’s gorgeous! Man down! Death by creme anglais! Hahaha. Looks delicious! Christa: I want you to know that I keep thinking about your comment and laughing out loud at random places, especially whenever I picture the image. So funny. Thanks for that. do you have a good hookup for vanilla beans yet?